Adelphi University is dedicated to transforming students’ lives with a personalized approach to education—with small classes, hands-on learning, and innovative ways to support student success. When you come to Adelphi University, you’ll realize we’re different from other schools. We take a personalized approach to education, with small classes, hands-on learning, life-changing internships, and innovative ways to support our students’ success. Adelphi is all about you—your goals, your success, and what fits you best. We’re a nationally ranked university just 23 miles from New York City and everything it offers. But while we’re less than an hour from the big city, we offer a small-school feel and a tight, supportive community of just over 5,300 undergraduate students. We’re a really diverse community too. Nearly 50% of our students identify as diverse, and our faculty are our most diverse ever. Inclusion and respect are our core values. 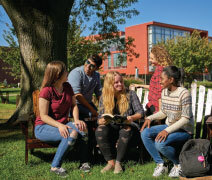 We offer everything you’d want to study, with more than 50 programs in the arts and humanities, STEM and social sciences, business and education, and health and wellness. With an average of only 21 students per class, you’ll get plenty of personalized attention from our world-class faculty. Our campus is welcoming, safe, and beautiful. How beautiful? It was voted Long Island’s best public garden in 2017. And you can live here in any of our seven residence halls and study in our state-of-the-art facilities. You’re probably wondering about financial aid: we’re generous with it. Nearly 95% of incoming first-year students receive some form of financial assistance. Chances are you will too. We’re proud to be nationally recognized by top organizations and publications. You’ll definitely want to get involved in campus life as an Adelphi student. You can run for student government, play in the orchestra, or participate in any of our 80+ other student clubs and organizations. You can join one of our 23 Division II teams or play intramural sports. Our students study abroad in many countries around the world. Studying abroad not only adds to the academic experience but also helps students acquire the global skills needed for today’s interconnected world. We offer so much to do, with a full calendar of art exhibitions, performances, lectures, and fun trips to New York City, local shopping malls, and nearby beaches. We’re also relentlessly dedicated to your academic and career success. We’ll help you prepare your résumé, land internships, find your first job, or apply to graduate school. We have partnerships throughout the region, giving you ins for internships at businesses and nonprofit organizations, and our more than 115,000-strong alumni network is a solid source of career-making connections. Adelphi students are positioned for success after graduation. It’s no surprise that 94% of our graduates have jobs or are attending graduate school within six months of graduation. Top-notch academics, small classes, individualized attention, a focus on your success—it all adds up to a transformative experience, one you can get at Adelphi University.